Exercise can help relieve depression – and a recent study found that the effects are immediate (if short-lived). Researchers at the University of Texas at Austin conducted a small study involving 40 people between the ages of 18 and 55, all of whom had been diagnosed with major depressive disorder. None were on antidepressants or exercised regularly. Half the patients were assigned to walk for 30 minutes on a treadmill; the other half were instructed to sit quietly for 30 minutes. All were asked how they felt five minutes before the sessions started and again at five minutes, a half hour and an hour afterward. The exercisers reported feeling much better – near normal – immediately after their workouts. Those in the comparison group showed no such changes. Although the positive changes lasted one hour or less among those who exercised, the researchers noted that they were comparable to the temporary boost in spirits depressed patients report after indulging in such bad habits as smoking or food binges. Earlier research has shown that regular exercise combined with medication and counseling can help resolve depression. The study was published in the December, 2005 issue of Medicine and Science in Sports and Exercise. Midlife is often considered a period of increased risk for depression in women. It is not known why, but it may be related to having a personal or family history of depression, life stressors, and role changes. 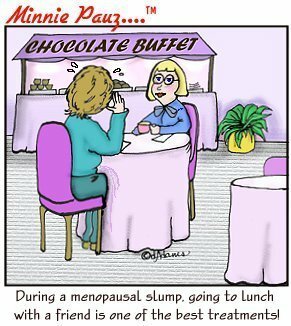 Menopause is often believed to be a time when women are more likely to become depressed. Studies actually show that depression is more likely to occur in the years during transition to , years. This period is associate with gradual declines in estrogen levels. Some studies suggest that changes in estrogen levels are associated with onset of depression. Many symptoms of menopause overlap with symptoms of depression including problems with sleep, physical symptoms such as hot flashes, fatigue, irritability, anxiety and difficulty concentrating. Some women suffer needlessly because they think these discomforts and problems are a natural part of aging. Depression should not be dismissed as a normal consequence of later life for women. Laughter is not only associated with release of tension induced by danger and signaling nonaggression but also with expressing good, positive emotions. It is a social glue that facilitates approach, contact, and intimacy between people and decreases stress from potential conflict. This could be the basis for the intuitive notion that "laughter is the best medicine." Laughter initiates a chain of physiological reactions. First, it activates the cardiovascular system, so heart rate and blood pressure increase. The arteries then dilate, however, causing blood pressure to fall. Repeated short, strong contractions of the muscles of the thoracic wall, abdomen, and diaphragm increase blood flow into our internal organs. Forced respiration (the ha! ha! of laughter) elevates the flow of oxygen into the blood. Muscle tension decreases, and we may temporarily lose control of our limbs, as in the expression "weak with laughter." People suffering from chronic anger have a higher incidence of elevated blood pressure, increased cholesterol levels, and heart attacks. While anger, depression, and frustration disturb the function of many bodily systems, including the immune system, laughter helps the immune system to increase the number of type T leukocytes (T-cells) in the blood, which combat damage and infection. Some researchers have dubbed T-cells the "happiness cells." Laughter may also produce beneficial hormonal changes. Scientists speculate that laughter releases neurochemical transmitters called "endorphins," which reduce sensitivity to pain and boost endurance and pleasurable sensations.